The nice thing about individually packaged food is that you know exactly how many calories you are going to inhale. When faced with a large hunk of cheese, Snack Girl usually finds that she has trouble sticking to just one ounce (it just seems SO little). And CHEESE can be a problem. Unlike radishes, which you can eat as many as you would like and still remain a size 4, cheese will make you wider. But cheese isn't unhealthy! It has protein and calcium and there are so many different and beautiful varieties. Of course there is saturated fat and it packs many calories so you have to be careful. In college (back in the Pleistocene again), I was fortunate enough to live in France above a Fromagerie (a store completely dedicated to selling cheese). It smelled like sweaty socks, but I still would go inside. The shop owner would give me little samples to help me determine which slice I would bring home. Basically, I had a twice weekly cheese tasting that led me to love the stuff. Now, I am getting off memory lane to discuss the packaged cheese stick. Kraft Singles are a great example of a processed cheese and are a "pasteurized prepared cheese product". You know the orange ones in the plastic sheets? MILK, WHEY, MILKFAT, MILK PROTEIN CONCENTRATE, CONTAINS LESS THAN 2% OF SALT, CALCIUM PHOSPHATE, SODIUM CITRATE, WHEY PROTEIN CONCENTRATE, SODIUM PHOSPHATE, SORBIC ACID AS A PRESERVATIVE, APOCAROTENAL (COLOR), ANNATTO (COLOR), ENZYMES, VITAMIN D3, CHEESE CULTURE. You can even find organic REAL cheese sticks from a company called Organic Valley. How do they taste? Well, they taste kinda bland. I like them because I can find them at my local convenience store when I am stuck without a snack. I can just grab one of these and I will feel satiated until dinner. If you like cheese, this is a great way to have it without over doing it. Any thoughts on cheese sticks? I love these types of healthy snacks, I just wish all that plastic packaging was recyclable or could be tossed in a compost pile. Cheese sticks are something I keep on hand, too. For some reason, they seem to go really well with an apple! My family loves the Babybel cheese circles for a snack. The Laughing Cow cheese is great, too! My 18 month old toddler loves cheese sticks. I tend to eat low carb and find they are a great snack during the day. I'm a teacher and they make good snacks for my 7th grade students. Sometimes I will buy a large bag from Costco for class "treats" instead of cookies or candy. Sometimes I'll give students a cheese stick and an apple (like Jennifer) if they've had breakfast. I love 'em! Weight Watchers Cheese Sticks are Awesome!!!! on only 1 PointsPlus. they also now came out with a smoky flavor. I also eat the Lite Mini Babybel cheese which are also 1 PointsPlus. Love cheese sticks! I stock up on them when they go on sale and always have them on hand I take at least one each day in my lunch. My toddler likes them too... He also likes the Kraft singles... I guess I should try to steer clear of those in the future. If you like these cheese stix, try following a low-carb lifestyle, and you can pretty much have as many as you want! Great high protein snack. Cheese doesn't = flab, carbs (sugar) do! 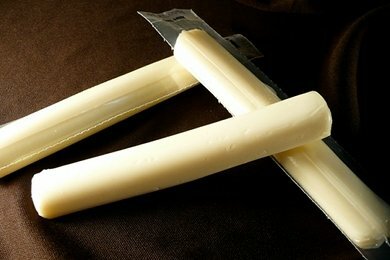 I love cheese sticks and often keepp them on hand to satisfy my cravings for cheese. I love cheese very much. I have always bought the PollyO for the family and they are a big hit and also a great deal at BJ's. I recently bought the weight watchers cheese sticks for myself and found that I actually like them better then the PollyO. My 12 year old son accidently grabbed a WW stick instead of the PollyO the other day and has decided that he likes them better too! Add a 100 calorie pack of almonds and you have a nutritious, portable snack that will keep your hunger at bay and tummy happy. No food is good or bad for those stating carbs are bad or cheese is bad. Everything in moderation. My issue with cheese sticks is the amount of packaging. I just have not been able to convince myself that my need for cheese convience is worth the landfill cost. Instead I buy smaller blocks of cheese get out my scale and measure servings a few at a time into reusable containers. A little bit of effort but I know how much I am getting and don't feel eco-guilt about it. I also get to pick cheeses that don't come in string variety like brie, cambert, gorganzola etc. Very fun and decadent treats. A company called Terracycle works to up-cycle packaging like this. My niece's school collects the trash, sends it to Terracycle and the school earns money for it! Terracycle does this for a lot of different types of packaging. Pretty neat. I like to wrap a couple of slices of turkey around one as a snack before the gym! I firmly believe that kids become cranky and irritable when their blood sugar levels have fallen due to end-of-day fatigue. So I always made sure that I had some cheese sticks on hand when I was driving my daughter home from school. A drink from her water bottle and a cheese stick later and she was back to her usual relaxed, smiling self! For those who are stuck on the Eco thing: anyone who A) takes a newspaper (recyled or not) B) drinks sodas/bottled water of any kind, any container, or C) uses disposable diapers should not worry about the tiny bit of excess packaging on string cheese. Really, the health benefits outweight the miniscule eco cost especially when one uses any of the three products mentioned above. That said, we use string cheese as a treat (one per day, not available but every other week or two) for our kids in an effort to get them to eat healthy snacks. It works! Ordinary snacks are apples, carrots, etc... so these are a hit because they are somewhat rare. was looking for something i can snack on with the cheese sticks and got some good ideas. i'll go with the turkey slices,almonds and apple slices and a low calorie low sugar drink. I'm trying to let me girlfriend know that she don't have to spend a lot and still eat healthy on her lunch breaks instead of always eating out. She works at a walgreens. I love these too!!! I love cheese and am new to weight watchers. portion control has always been an issue for me and these really help - I microwave them in a low fat low calorie wrap or pita with a side salad for a quick snack!!! The Fit 'n Active brand that Aldi sells are also 1 PP and are very good. These are awesome pulled apart, melted over... well... anything! I've been doing toast, but Triscuits or Pita chips work too. Melt in the microwave and top with a ton of salsa. YUMMY! I love cheese, especially cheese sticks. I can just eat a lot then practice sports to consume that calories. To make an informed decision compare the nutritional contents of "cheese" sticks and that of a simple pear as given by the USDA. The biological attraction to "cheese" sticks is in most part due to the sodium content and the false belief that humans need to ingest calcium to generate healthy bone structure. If this were true all vertebrates would be dairy dependent. Yet nature shows us evidence to the contrary through mammals which continue to develop their bones after the suckling phase. In addition reptiles, amphibians and birds do not intake any form of dairy for skeletal development. I love your recipes and tips! Cheese, trail mix and water. Always in my bag when we go out.3 munchkins keep me hopping. . By snacking on healthy options between healthy well portioned meals I've become more healthy over all, and the kids have been more likely to choose healthy! I microwave cheese sticks, at 10 second bursts, WITHOUT UNWRAPPING THEM FIRST(!) Usually by 15 sec, they are nice and bubbly. The taste and texture are extremely satisfying, especially with an apple slice. I want to know why mozzarella cheese sticks have so much sodium. Is it because it is necessary due to the way the cheese is made? I am trying to cut back on sodium.